"If the ruling party has power, opposition must at least have its say. But at the end of the day, democracy says that opposition must have its say and the government must have its way because it is as per the mandate of the people," Mr Naidu said in his first speech as the Rajya Sabha Chairman. New Delhi: Newly sworn in Vice President M Venkaiah Naidu told the opposition on Friday that he will ensure as the Rajya Sabha Chairman that they have a say when legislations are debated but the government will finally have its way as it has the mandate. The former BJP President said he was "an all-party man" now and his role was "above politics". "I will meet your expectations. Everyone among you will get an opportunity but everyone must follow the rules and regulations (of Parliament," Mr Naidu said in response to welcome speeches by Rajya Sabha members. He said politicians must not look at each other as enemies but as "rivals" in their common endeavour of "working hard to strengthen the country and help people". "Democracy is not about numbers but to understand and appreciate each others' point of view. We must debate, discuss, decide and deliver," he added. 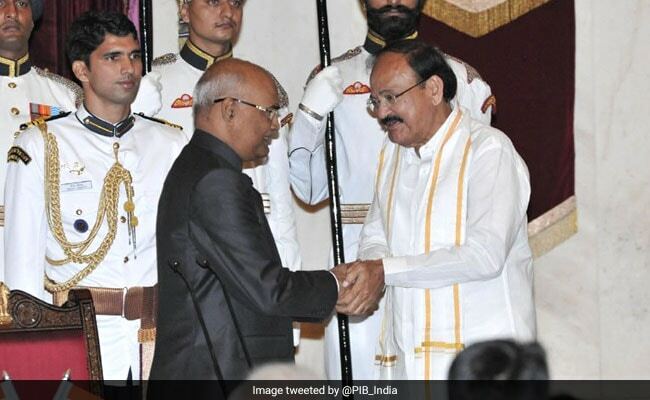 Mr Naidu, 68, earlier took oath as India's 13th Vice President, succeeding Mr Hamid Ansari, who finished his decade-long two terms as Vice President and Rajya Sabha Chairman on Thursday. In his address to the Upper House, Mr Naidu recalled his "humble background" coming from a peasant's family. He credited his political success to the "might" and "beauty" of the Indian Constitution.